This was a first experience of having one of my artwork stolen. I had poured my heart into its creation. I have experienced breakage before since I do kiln cast glass (thermo shock, dropping, incompletely filled mold etc.) and that hurts, but I got over the disappointment and took measures to avoid, if not eliminate this occurrence. Now this is different, and one wonders what happened to my “The Reader 2” sculpture! This is the reason for the Missing Poster. I made a police report and send them a picture of the work. 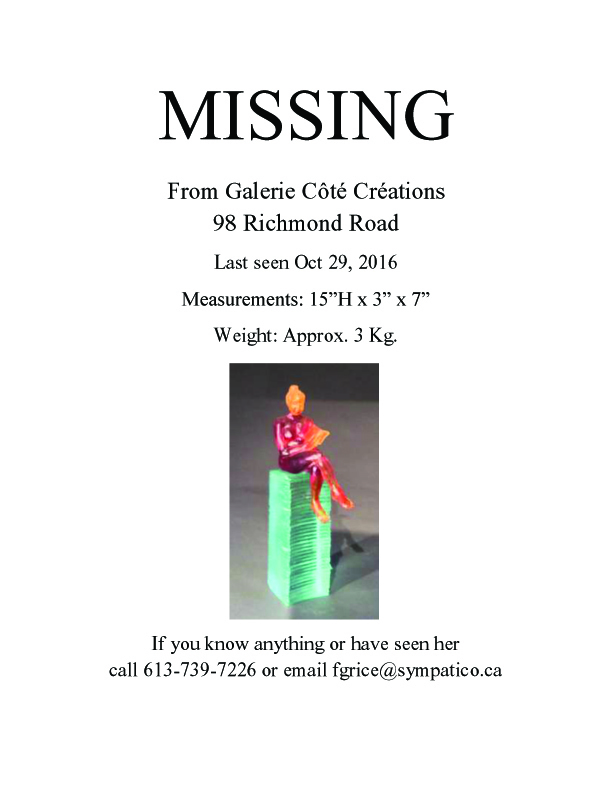 I can’t help thinking someone in the neighbourhood of the gallery took it (this would be around 98 Richmond Road, Ottawa) But I also know there is little hope of seeing my Reader again.